Remember Dory’s words...“just keep swimming, just keep swimming...” when she was starting out to look for Nemo? 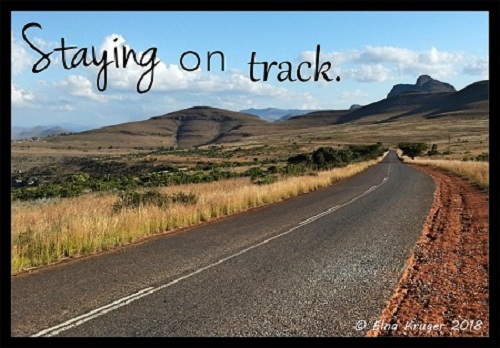 These words describe the motto one should have when you’ve passed more than the halfway mark for the year and the road ahead still looks far to go.... It’s about staying on track, and not getting ‘sidetracked’ so much that you might ‘lose track’. Those times when you feel like the year is getting just that little bit too long, persist in doing what you’ve planned to do. With the last quarter just around the corner it is easy to become ‘weary in well-doing’, allowing things to slip, ignoring issues, or just letting go and slowing down the pace too much. Don’t slip on work to be done just because you and your children are familiar with the material. Just because you know that there is a test at the end of a lesson and your child have been writing these doesn’t mean that the test can be dropped now. Another thing which can become easy to slip up with, is regular measuring. Do not think that because your child has managed certain content in a book, you can now just trust him to continue doing so without checking…. It is still necessary to diligently work with your children, and if they are already working independently, to still check their progress daily and weekly. It is not just the children who need to be faithful in the little things….we must also remain interested and involved. Our attitude will determine the children’s attitude. Sometimes, children can also complain that they are getting bored with the same routine and the same work…I understand that, and one can spice up the boring days with doing something different. www.homeschooling-ideas.com is one of those websites where you can get ideas on fun things to do. It is also tempting to want to stop with some work when you are just tired. During this quarter it will not be wise to just change or stop curriculum unless for a specific and valid reason. It is better to try and finish something – you can adjust the approach to work through it faster or with a more overview approach, but the sense of accomplishment will be good when finishing something. Often the temptation to just leave things are bigger when things are not working as expected, relationships are strained or there is some big ‘project’ going on (like moving house, or building on) or some disruption (a new baby, or serious illness, or dad away for a long time) causing things to be unusual and not normal. Don’t leave things altogether but rather slow down and take it a bit easier – keep a simple routine and keep on doing the ‘little bit every day’. Whenever I’ve felt like just leaving/stopping stuff, it had always turned out better to just keep on following the plan, at least until the end of the year. I’ve only changed our homeschool’s routine, rhythm, curriculum(s) or structure when I had enough time for proper reflection on our vision, our goals and objectives. During the break between the third and fourth quarter I usually do a quick revisit to our Vision and Course of Study (as defined in Homeschool Curriculum Guide's unique 7 step process Steps 1-5) so I can plan curriculum for the next year. This allows enough time to research and order new curriculum well in advance for the following year. I believe that staying faithful in the little things always pay off in the long run. Worthwhile endeavours is the faithful accomplishment of the small tasks! After many years I can testify how proud children are when they look back and see what they’ve done.....especially when they know there was a time that they wanted to give up, but didn’t. So help your children through these patches of staying faithful.